MIAMI, FL / ACCESSWIRE / March 25, 2019 / Novus Acquisition and Development, Corp. (OTC PINK: NDEV), through its wholly owned subsidiary WCIG Insurance Services, Inc., is a diversified insurance entity in health, liability, annuity and accident, and, the nation’s first carrier/aggregator offering a cannabis health plan, today reported financial and operational results for its fourth quarter and year ended December 31, 2018. Marijuana legalization had a very good mid-term elections in November 2018. The big news came from Michigan, which became the first state in the Midwest to legalize cannabis for recreational purposes. And it appears to have won by a fairly big margin: With 87 percent of precincts reporting, the ”yes” vote got 56% of the vote – topping the ”no” vote by 12 percentage points. There were also a couple of medical marijuana victories in Missouri and Utah. Both states went Republican in state races (particularly the Senate), yet they still showed solid support for legalizing medical pot. The winning measure in Missouri got 66% of the vote, and the initiative in Utah is so far, with 95 percent of precincts reporting, at 53%. The one bit of bad news for legal marijuana came from North Dakota, where voters rejected an initiative that would have legalized cannabis for recreational purposes. That measure got less than 41% support. But the North Dakota loss was widely expected. North Dakota is very conservative; it was always very unlikely to fully legalize pot before, say, liberal New York and New Jersey. The measure’s chances were likely lowered further because it was very unusual: It would have legalized selling pot without any regulations, leaving it to the state’s lawmakers to quickly enact rules instead. Typically, marijuana legalization measures at least set up a regulatory framework for sales. In short, marijuana legalization got three major wins and an expected loss. Beyond the midterm elections, 2018 has been a big year for marijuana legalization. California opened the world’s biggest legal marijuana market, Vermont legalized marijuana possession (becoming the first state to do so through its legislature), and Canada became the world’s first wealthy nation to fully legalize pot. At the end of 2018, 10 states have legalized marijuana for recreational and medical uses, and 22 others have legalized only for medical purposes. After a lengthy process through Congress, the President signed into law The Agriculture Improvement Act of 2018 (the 2018 Farm Bill) on Dec. 20, 2018. The bill replaces the Agriculture Improvement Act of 2014, which expired Sept. 30, 2018. Distributing more than $850 billion, the 2018 Farm Bill is an enormous piece of legislation that funds programs such as crop insurance, school lunches and the Supplemental Nutrition Assistance Program (SNAP), aka food stamps. Integrated into the Farm Bill is the bipartisan-supported Hemp Farming Act of 2018. The act’s inclusion is significant: industrial hemp and its derived products now are legal on a federal level, and states may choose how to move forward in this exciting new industry. Spearheaded by Sen. Mitch McConnell (R-KY), The Hemp Farming Act federally legalizes the production of industrial hemp (defined as Cannabis sativa L. plants containing less than three-tenths of a percent of tetrahydrocannabinol (THC)). The low concentration of THC makes hemp unsuitable for marijuana production, which remains federally illegal. The 2018 Farm Bill abolishes this inconsistent treatment by removing industrial hemp from the definition of ”marihuana” in the CSA. In addition, THC contained in industrial hemp will be removed from the purview of the CSA, making clear that industrial hemp plants can be grown domestically as well as imported. This amendment to the CSA decriminalizes the production and use of hemp and its derived products that match the definition of industrial hemp, such as seed oil, CBD oil, fibers and paper. Industrial hemp will not be entirely unregulated, however. The 2018 Farm Bill moves regulatory authority from the CSA and DEA to the Agricultural Marketing Act of 1946 (AMA) and the Department of Agriculture. The AMA authorizes and directs the Secretary of Agriculture to carry out programs to assist the production, transportation and marketing of crops. Now that the Hemp Farming Act of 2018 is law, hemp will be treated the same as any other legal crop by the Department of Agriculture, with a few caveats based on its previous status as a controlled substance and the potential for unscrupulous growers to cultivate strains with high THC levels. a procedure for enforcing regulations. The plan may include anything that does not conflict with federal regulations. The Company showed continued growth in fourth quarter of 2018 due to Facebook (FB) rejecting ads that contain the word ”cannabis”, this came on the heels of FB Federal Government inquiry on privacy of its users. This has subsided and now we can generate digital ads on FB along with our marketing mix to support the business model, is not solely reliant on FB and we have stepped up other avenues of marketing that have been responsive. Agreement with Alloy Insurance Services, a new group provider to bundle Novus Cannabis MedPlan, expands footprint. Novus executed a bundling agreement with Alloy Insurance Services LLC, an entity that provides employee benefits and administration services for over 50,000 employees nationwide. Plans to file as a Health Maintenance Organization (HMO) in the State of California. Novus Cannabis MedPlan had a positive initial teleconference with the California Department of Managed Health Care (CDMH) regarding filing its Cannabis MedPlan as a Health Maintenance Organization (HMO). Additional follow up reviews and evaluations by CDMH beginning as early as January 2019. Novus Cannabis MedPlan, once approved, will initiate as an HMO or at least specialty insurance carrier where it will agree to pay cannabis providers specific levels of compensation for a range of services they provide to its patient/members commencing in the State of California. In return for a monthly fee, or premium, patient/members are granted access to providers inside Novus’ cannabis network at no additional cost. · Patients: Reduce healthcare costs with likely reimbursement of cannabis meds and services for patient/members. · Providers: As an HMO cannabis network provider benefits by supplying them with more patients. · Employers: Growing interest in Novus Cannabis MedPlan by many Professional Employment Organizations that want to integrate THC and CBD Plans for their client base in an health insurance format. The achievements are expected to be catalysts for accelerated growth in 2019. PEO’s are companies that sell business insurance, employee benefits and administration services on the behalf of employers. During the third quarter of 2018, the emergence of interest from PEO’s saw the value proposition of where they can generate revenue by bundling our cannabis health plans. Our current contract with Alloy Insurance Services targets 50,000 employees looking for alternative benefit plans. We expect to enter into similar contracts with additional PEO’s making our future growth effort productive. We contracted with Revolution Insurance Technologies (RIT), a Silicon Valley FinTech that owns a proprietary digital platform that integrates benefit packages from the world’s top insurance carriers. This partnership assists insurance broker/agent to create customized packages from diverse carriers and bundle those products that meet the needs and price of the customer. To-date we have recruited 450 agencies/brokers/affiliates to educate and sell our cannabis health plans to the consumer and now with RIT, we send them to one platform that will assist them in efficiently adding our product in one bundled quote. In 2018, Novus experienced an increase by 20% of CBD enrollments. This was contributed to our contract with U.S. Hemp Wholesale, the country’s leading CBD provider with channels of distribution from the country’s top 20 CBD manufacturers that drop-ship to Novus’ patient /member network. The growth potential of CBD could be worth $20 billion by 2022. The future of CBD and its effectiveness is promising with the Federal Farm Bill that was signed into law before Christmas, permitting all states to cultivate hemp. On a regulatory level this is a complex issue since the new law eliminates hemp-derived products from its Schedule I status under the Controlled Substances Act but does not legalize CBD federally. The only exemption is GW Pharmaceutical’s Epidiolex, a pharmaceutical grade of CBD. This action now plays a key part to controlling the barrier of entry for many new CBD products with the cost of research and development contributing to a stronger new market. However, all three detriments proved to be short-term and resulted in more positive outcomes by the end of 2018. Sessions left office without making any impact on the Department of Justice to enforce marijuana prohibition. In Michigan, we lost 40% of our in-network dispensaries due to new regulations imposed by the state shutting down many retail locations. However, the state has since issued an additional 50 new licenses for the opening of dispensaries in and around the Detroit area, and they are rapidly becoming in-network providers. The California tax hike resulted in a positive favor for Novus with an increase of patient members enrollments by 5% in that state, showing that Novus has some resiliency to this adversity with the dexterity to adjust and adapt. Marketing our cannabis health plan continues to be challenging with strict federal and state rules as well as restrictive social media platform guidelines making it a constant task to procure new patient/members. We overcame this obstacle by executing a contract with Enlighten, a well-known in-dispensary interactive advertising platform that educates the consumer at the point of sale with tailored offerings. Its technology platform is intended to increase revenue and awareness and keep customers engaged on Novus’ suite of health plan packages. Adding this venue to our marketing and advertising mix is estimated to increase patient/ members this year. You’re invited to review our revised benefits packages: http://bit.ly/2PjDvon. Targeted for an April roll out Novus’ telemedicine platform plays a very important role in healthcare to our patient members and is anticipated to be bring multi-revenue stream into the Company. Telemedicine technology allows healthcare practitioners to consult with patients in real-time via telecommunications technology to evaluate, diagnose and treat patients remotely. Telemedicine is attracting attention globally and is seamlessly suitable for medical cannabis and traditional health insurance benefits. Now patients can connect with Novus’ online platform with a physician across U.S. and Canada from the convenience of their own digital device. Delivering what many patients require is autonomy, free medical cannabis certifications with connection to our in-network dispensaries that can recommended/procure appropriate med strains. Help physicians efficiently reach more patients across the country can increase revenue. Revenue increased by 30% to $49,355 for the three months ended December 31, 2018, as compared to the three months ended December 31, 2017. The growth was primarily due to greater awareness and visibility of the Novus Cannabis MedPlan offering and increased number of strategic partners and dispensary providers. The improvement in key performance indicators (KPI) in the Company’s in-house marketing efforts, resulted in a greater number of providers, patient members and lives covered. Operating and Net income remained strong at $18,794 for the three months ended December 31, 2018. This represents a 38.1% operating profit margin for the three months ended December 31, 2018. The Company’s Balance Sheet remained strong with an increase in the cash balance to $115,173 and the Net Asset Value (NAV) of $1,395,552. Revenue increased by 38% to $180,171 for the twelve months ended December 31, 2018, as compared to the twelve months ended December 31, 2017. 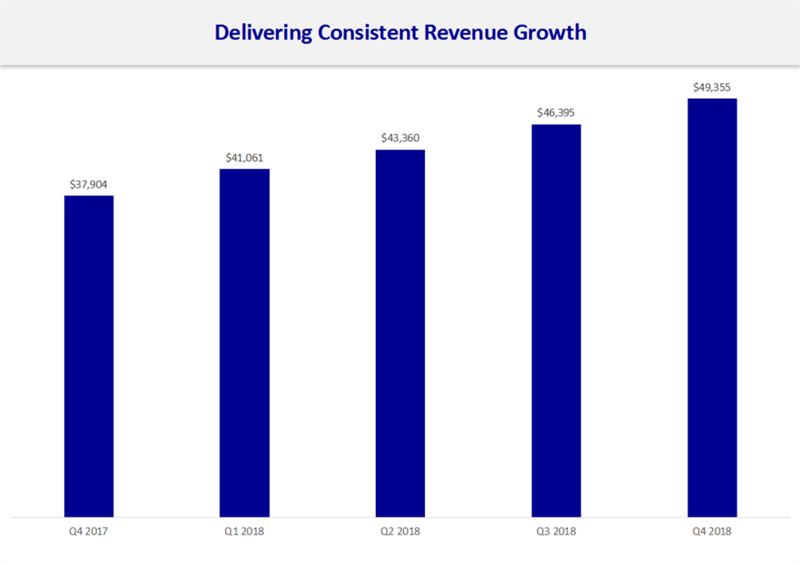 The growth was primarily due to greater awareness and visibility of the Novus Cannabis MedPlan offering and increased number of strategic partners and dispensary providers. The improvement in key performance indicators (KPI) in the Company’s in-house marketing efforts, esulted in a great number of providers, broker/agency participation and coverage patient/ members. Operating and Net income increased by 48% to $95,912 for the twelve months ended December 31, 2018, as compared to the twelve months ended December 31, 2017. This represents a 52.3% operating profit margin for the twelve months ended December 31, 2018. The state laws are in conflict with the federal Controlled Substances Act. The current administration has effectively stated that it is not an efficient use of resources to direct federal law enforcement agencies to prosecute those lawfully abiding by state designated laws, allowing the use and distribution of medical marijuana. However, there is no guarantee that the current administration, nor any future administration, will not change this policy and decide to enforce the federal laws strongly. Any such change in the federal government’s enforcement of current federal laws could cause significant financial changes to Novus Medical Group. While we do not intend to harvest, distribute or sell cannabis or cannabis related products, we may be harmed by a change in enforcement by federal or state governments. This release includes forward-looking statements, which are based on certain assumptions and reflects management’s current expectations. These forward-looking statements are subject to a number of risks and uncertainties that could cause actual results or events to differ materially from current expectations. Some of these factors include: general global economic conditions; general industry and market conditions and growth rates; uncertainty as to whether our strategies and business plans will yield the expected benefits; increasing competition; availability and cost of capital; the ability to identify and develop and achieve commercial success; the level of expenditures necessary to maintain and improve the quality of services; changes in the economy; changes in laws and regulations, includes codes and standards, intellectual property rights, and tax matters; or other matters not anticipated; our ability to secure and maintain strategic relationships and distribution agreements. Novus disclaims any intention or obligation to update or revise any forward-looking statements, whether as a result of new information, future events or otherwise. SOURCE: Novus Acquisition and Development, Corp.